Every pharaoh, king, and queen in ancient Egypt wore a hieroglyphic seal called a "cartouche." They believed it brought power and protection. 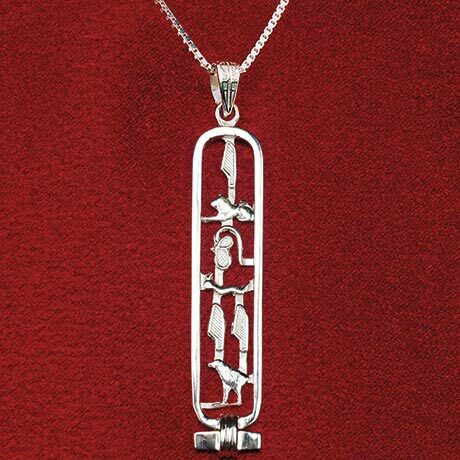 Handmade in Egypt, yours will bear your name (or someone else's), spelled out in hieroglyphic characters. "ILoveU" is shown. Specify up to 7 letters; pendant will measure about 1 1/2" to 2" depending on the number of characters. Sterling silver pendant comes on an 18" sterling chain; 18K gold is pendant only, no chain. Includes a copy of the hieroglyphic alphabet. No rush delivery or gift box. Allow 3-4 weeks. Sold Separately. Item can only be shipped within the Continental US.